Chrysler's #1 preferred spare tire carrier! 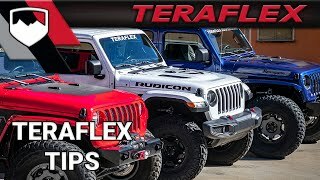 Ever since engineering the first coil spring lift kit for the then-new TJ Wrangler, TeraFlex has been at the forefront of innovation and performance for the Jeep Wrangler market. Never resting on our laurels, we raised the bar yet again with the innovative JK/JKU Alpha Heavy-Duty Hinged Spare Tire Carrier & Alpha Heavy-Duty Adjustable Spare Tire Mounting Kit. First shown at the 2012 SEMA Show, it quickly became the most popular tire carrier in the industry! Not only did our JK/JKU Alpha Heavy-Duty Hinged Spare Tire Carrier leave our competitors’ heads spinning, but it inspired them to “develop” their own hinged spare tire carrier. It took them nearly five years to produce an inferior product lacking many of the features of our Alpha Heavy-Duty Hinged Spare Tire Carrier & Heavy-Duty Adjustable Spare Tire Mounting Kit. Designed to accommodate up to a 37” tire, the JK/JKU Alpha Heavy-Duty Hinged Spare Tire Carrier & Alpha Heavy-Duty Adjustable Spare Tire Mounting Kit will secure your spare tire over the most extreme trails and rugged terrain. Our hinged spare tire carrier offers easy access to the rear cargo area in one smooth action. Using the factory tailgate hinge mounting points spreads the load of the spare tire over a larger area for maximum strength and durability. Dedicated tooling and A356.2 T6 cast aluminum construction with a UV top coat, make our Alpha Heavy-Duty Hinged Spare Tire Carrier as light and as strong as possible, while its design, fit, and finish complement the JK Wrangler and JKU Wrangler Unlimited models’ body shape. Internal gussets and bracing in the stock Wrangler body supports the Alpha spare tire carrier and oversized tire. 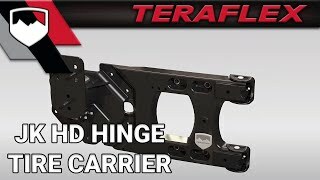 Heavy-Duty forged steel brackets and heavy-duty 5/8” hinge pins constructed from fold formed high-carbon hardened steel combined with the factory mounting locations ensure the strongest rattle-free tire carrier available. With the heavy-duty reinforcement carrier supporting the weight of the tailgate assembly and spare tire, the Alpha spare tire carrier removes all stress from the tailgate. The Alpha spare tire carrier also provides additional mounting points for off-road accessories such as a recovery jack and fluid containers. • Requires aftermarket wheels w/ 5” backspacing or less – or Alpha HD Hinged Spare Tire Carrier Wheel Spacer Kit (# 1055005) for stock wheels. Great combo. Running 35" Toyos and my spare is super secure. Easy install. Will need a way to press wheel studs into mounting plate through oversize carrier piece. Solid solid products. Very well made, no rattles at all. The tire is very close to the door witch is great when coming off ledges. It's a bit stiff when I first put it on, but is now not as much. I love my Teraflex tire carrier!!!!! It seriously saved the gate on my 2008 JK! My tire's are 35's so my spare is of course the same. Well that size of tire was starting to pop the welds in the gate of my jeep, so I needed to do something, and FAST! The minute I put the Teraflex tire carrier and hinge set up on, no more shaking or rattling at all!! Money well spent!!! 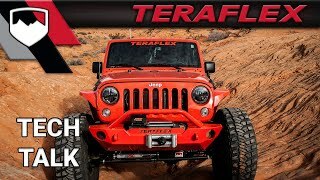 Thank you Teraflex!! I've had this hinge and the TF carrier on my JK for 12 months carrying a 35" tire on a 17" wheel, with no issues and no rattles. The installation was simple, I followed a video from TF and another I found on YouTube and it couldn't have been easier. Highly recommended. This the best tire carrier on the market and solid. I carry a 37" tire on it and I can't tell any different when I open the tailgate. I've had this product for 12+ months now, and it is one of the best things I've done to my Jeep. Rock solid. Absolutely no rattles or bouncing. Just take your time and follow the instructions for a perfect fit. Just installed and other than muscle to break bolts, I was able to do this install without help. Very solid, very well built, and easy install what more could you ask for? Immediately noticed the difference from stock and much prefer this set up over a separate carrier. 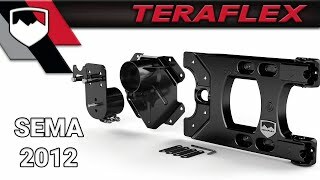 Thanks TeraFlex for keeping the standards high! Just got it - went on easy, fits like a glove. Like it grew there on its own. Got the carrier accessory as well, but now noting a few other tapped holes.... Is there more stuff coming? Told the wife it carries more weight... She wants a bike rack on it... Give a girl a cupcake, she's gonna want sprinkles. Could it take a bike rack? What can I say, yet another high quality product that Teraflex offers. If you want the best then I suggest going with this tire carrier. 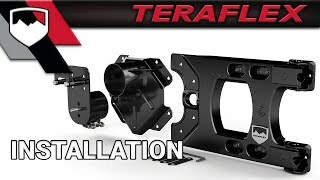 Very sturdy, easy to install, and allows the ability to mount more items to your Jeep. Superb product. I had my spare 35 on factory bracket with extension and, while functional, the shuttering on the tailgate was teeth clenching much less what was happening to the tailgate itself! I installed this product in well under an hour and what a difference. The tire is up close to the jeep, not a foot away! it is solid, secure and the tailgate even shuts solid now. Great engineering, easily installed, superb quality. A must if you are avoiding tire carrying bumpers! Plus their install videos with Dennis are hilarious, goofy and still yet informative! I did have to relocate my vhf antenna from behind the tire (not the best spot for it anyway) to the passenger side. but go figure, Teraflex has a bracket for that too, which also worked perfect! While there are less expensive solutions out there, they are not comparable to this product. Love my tire carrier. I was always worried about my 35" spare coming loose or damaging my tailgate. Not anymore, this item is top notch, solid and the quality is excellent. About two years ago, I purchased the Alpha HD Hinge without the HD spare tire carrier because I'm cheap. I used the factory tire carrier, and honestly, it works really well. The adapter that comes with the hinge creates a perfect fit. HOWEVER, I just recently purchased the Alpha HD Spare Tire Mount, and I highly recommend this combination for one major reason. The factory tire carrier set my 33" tire + 18" AEV Salta wheel (+10mm offset) nearly 4" away from the hinge. The Alpha HD snugs my spare right up against the hinge. Now, if you only take your Wrangler to the mall and grocery store, 4" is irrelevant. I live in Utah, and my JKU likes to play in the woods and snow. Physics tells us that a heavy tire 4" away from the rear gate will sway laterally more than that same tire compressed against the gate. Just makes sense from a safely and wear-and-tear standpoint. There is another practical consideration for anyone who not only Jeeps but travels with mountain and road bikes. With the factory spare tire mount, the measured distance from my hitch receiver pin hole to the outer edge of my tire was just under 14", making it impossible to find a hitch style platform bike rack that can fold upward when not in use. With the Alpha HD spare tire carrier, almost any brand of hitch style platform bike rack will work! Don't be cheap! If you are getting the hinge, do yourself a favor and get the entire kit. I bought this under 4 months ago and it has cracked where the cinch tabs are welded to the bracket that mounts to the door hinge replacement. It’s got a nasty “popping” noise. Wish I could attach a photo... I’ve got a 37x12.5 mounted on it, so it’s heavy. I deflated the tire slightly during install to help get it snugged up nicely. Not a fan of having to call for warranties, plus having bought it from a local off-road shop, miss placing the receipt puts a damper on things. I do think it’s a great product, just got unlucky.